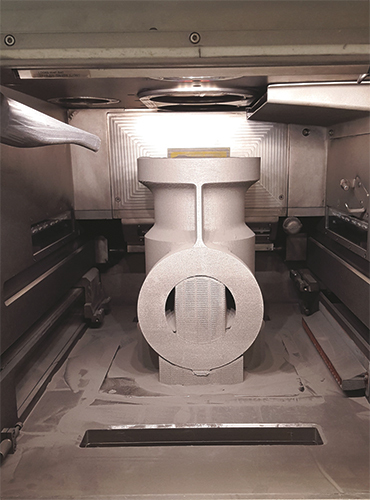 A large 3D-printed titanium part recently was produced in rapid fashion thanks to the use of dual 400-W lasers, proving the additive-manufacturing (AM) process as viable for manufacturing larger parts. That’s the word from SLM Solutions, which announced completion of an aircraft component that measures 12.21 by 8.74 by 8.66 in.—the largest part to date built in an SLM280HL 3D printer with dual 400-W lasers. The dual-laser setup made it possible to build a part of this size in a relatively short time frame compared to conventional manufacturing. The standard build plate size for machines of this class is 250 by 250 mm. However, the SLM280, with its increased build plate size at 280 by 280 mm, makes larger-sized parts possible. SLM Solutions, using selective laser melting (SLM) technology, has worked to overcome size limitations of the build chamber and the other challenges that come with building large titanium parts. Also significant: printing a part of this size in titanium in such a short time, something that could not have been achieved had the part been machined out of a billet. Importantly, the part exceeded quality and density requirements.